Today, our online banking, text messages, and ecommerce sites all use encryption to ensure our personal information is secure and stays out of the hands of those with malicious intent. Computers power this encryption, scrambling data using complex mathematical formulas in a matter of minutes, but that wasn’t always the case. In World War II German armed forces had a different method of encryption. 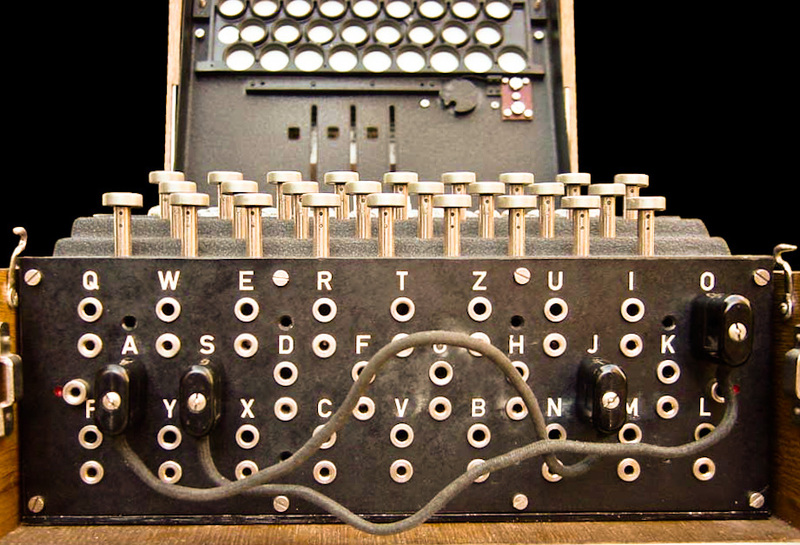 They used a device called the Enigma machine to send encrypted messages between Berlin and army commanders in the field. The machine resembled a typewriter and weighed about 26 pounds. It was able to create a staggering 150,000,000,000,000,000,000 combinations and was thought, at first, to be an infallible way to keep classified information from the enemy. A team of 10,000 codebreakers, mostly women, proved the Germans wrong, however, and successfully cracked the Nazi Enigma code. Before we dive into how the code was cracked, let’s take a look at how the Enigma machine created the code in the first place. Just like a typewriter, the Enigma machine has a keyboard so that you can easily type out your message. The keyboard is linked to three rotors using an electric current that can transpose each keystroke, effectively working as a random letter generator. This means that the letter ‘A’ for instance, is transposed to a different letter each time. With each keystroke, the transposed letter lights up on a second keyboard called a lampboard. This transposed letter is determined by the starting position of each rotor. Each time you press a key, the rotors move a notch, like the hands of a clock. Each letter on the keyboard is also connected to a plugboard with another series of letters. By moving the wires on the plugboard, you can direct the keyboard to transpose an ‘A’, for example, using the code for the letter ‘Q’ and vice versa, further scrambling the message and making the encryption significantly harder to decrypt. Once the message is typed out and encrypted it’s sent to another Enigma machine via Morse code. The level of encryption goes even further. Everyday, the creator of the message resets the order of the rotors, their starting positions, and the plugboard connections. This meant that whoever is meant to read the encrypted message has to know the Enigma’s daily settings. In Word War II, the calendar of settings for each month was noted on a piece of paper and hand-delivered by a trusted messenger--a time consuming and highly risky mode of distribution yet it was the securest option available at the time. Inspiration for Turing’s device came from a Polish machine called the bombe. The bombe had 500 electrical relays, 11 miles of wiring, and a million soldered joints to complete the gargantuan task of testing countless hypotheses, or ‘cribs’ against intercepted cryptograms. Cribs were essentially words that were likely to occur in the message and could be determined by the consistent language used in Nazi propaganda. When a crib was guessed correctly, the codebreakers knew they had the key for every encrypted message sent on that day. This was a long and tedious process but the codebreakers prevailed and historians say their efforts shortened the war by as much as two years. Encryption has come a long way since the Enigma machine and the bombe but these historic devices were still incredibly sophisticated for their time. Remember, the Enigma was capable of creating over a quintillion combinations using rotors and cables. No fancy software required.